Membership in the APA has always been a great way to make contacts and market your services to prospective clients. We currently have five different membership levels. Before completing an application, please review the General Info and Listing Criteria sections below. You will NOT be able to proceed to the online application form until you have read and agreed to the terms in each section. 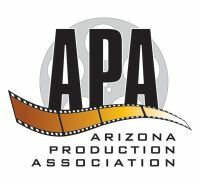 We look forward to welcoming you to Arizona's only statewide trade organization for film, theatre and television professionals! Student Members receive a listing in the student only section of our website with their name, contact information, website address and a description. There is a limit of one entry per Student. This level is only open to students between the ages of 18-25, and proof of age and current enrollment is required to qualify. Students also receive free or discounted admission to APA-Sponsored events. Supporting Members receive our printed newsletter, "On the Arizona Set," discounts on various goods and services and free or discounted admission to APA-sponsored events. They also receive regular news updates and information on upcoming industry events via APA's broadcast e-mail service, if APA is provided with a current email address. Members receive all of the benefits of Supporting Members, plus ONE listing in our online Production Guide. The listing includes contact info for one individual, one company name, a description of services, and hotlinks to an email and website address. Premiere Members receive all of the benefits of Supporting Members, plus TWO listings in the online production guide AND your choice of either an IMAGE or a LOGO included in the listings! The listings include contact info for one individual/company, a description of services, and hotlinks to one email and website address. A second individual's name may appear on the listings. Corporate Members receive all of the benefits of Supporting Members plus FIVE listings in the online production guide, AND an IMAGE or a LOGO included in the listings. The listings include contact info for one individual/company, a description of services, and hotlinks to an email and website address. TWO additional individual's names may appear on the listings. Listing Criteria must be met for all listings. Any existing member may upgrade to another membership level by paying the difference in dues and qualifying for the new level. However, your annual renewal date will not change. Seniors age 65 & Over receive a $20 discount off of the Member and Premiere levels with proof of age. In addition to membership, APA has volunteer opportunities available. You can get involved by helping out our Events, Internet, Membership, Southern Arizona or Marketing Committees. Being on a committee is a great way to meet other industry professionals and keep in touch with the local production community. For individuals, listings in the Arizona Production Guide are open to Arizona residents only. For companies, listings are only open to entities that have at least one physical office location in Arizona and that are licensed to do business in Arizona (where applicable by law). Only Arizona addresses will be included in listing information. Three references or call sheets must be submitted for each category you wish to list in. The same references can be used for more than one category if the references can verify you have worked in all areas you wish to list in. For references, please supply names, phone numbers and email addresses of individuals not in your employ and not related to you (i.e. references should be clients or other industry professionals you have worked with in the past). Existing members wishing to change categories must also supply references for any new category not directly related to the existing listing (at the discretion of the APA). The default setting for the order in which listings are displayed on this site is "Random." However, when visitors to the site select "Alphabetical" as the sort order rather than "Random," then Listings appear in alphabetical order by company name OR by an individual's last name if no company name is on the listing. Numbers appear before letters (i.e. "1 Stop Production" would appear before "One Stop Production"). All punctuation is ignored (i.e. "A-1" would be simply "A 1" for alpha order), as is the word "The" unless it is part of your registered company name. If your company name begins with an "A" or a number, you must submit documentation to that effect. Acceptable forms of documentation include a copy of your name registration from the Arizona Corporation Commission or Secretary of State or a copy of your Transaction Use Privilege Tax License from an Arizona city. The documentation must match how the company name is to appear on your listings, so if you want to list as "1 Stop Production," your company must be registered as 1 Stop Production and not "One Stop Production." Each listing may contain no more than one company name. If you have more than one company and want to have listings for each company, you must purchase a separate membership for each company. Only one web site and one email address may appear in listings. Text formatting (i.e. bolds, underlines, italics, etc.) is not permitted within a listing's contact information or description of services. No photos or other visual imagery is permitted within listings. Exception: Premiere and Corporate Members may add an image or company LOGO to their listings as part of their dues. Members may add an image or logo for an additional fee. The same image or logo will appear on all listings for that membership. Descriptions may not exceed 350 characters in length per listing. If the state of Arizona requires you to be licensed to perform the services listed, you must submit a copy of that license before your listing will be accepted. Categories that require licenses include (but are not limited to) catering, acting/modeling agencies, drivers/chauffeurs/operators, medical services, Pyrotechnicians, teachers, security services/bodyguards and insurance services.